With Thanksgiving approaching, I thought What a Wonderful World would be a great song to discuss this week. The song focuses on appreciating the beauty of our surroundings using imagery from the 1960s. A positive and up-beat song was needed amidst the tensions of the 1960s with multiple assassinations, riots, the War in Vietnam, the Cold War and other International tensions. The song is said to originally be offered to Tony Bennett, who turned it down. Bennett would record and perform the song later, though. However, Graham Nash has a statement from Weiss in his book Off the Record: Songwriters on Songwriting that the song was specifically written for Armstrong. The song was not an initial hit in the United States, but was one in the United Kingdom, where it was the best-selling single of 1968. Part of the reason the song was not a success in the U.S. was because the boss at ABC Records disliked the song and did not promote it. The song gradually became a standard. Robin Williams plays the song in the 1988 movie, Good Morning, Vietnam. Numerous performers such as Anne Murray and Lee Ann Rimes have recorded the song through the years. Armstrong’s version was inducted into the Grammy Hall of Fame in 1999. 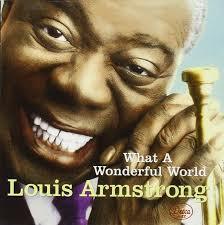 Although very different from his traditional jazz standards, What a Wonderful World is the song most associated with Louis Armstrong.